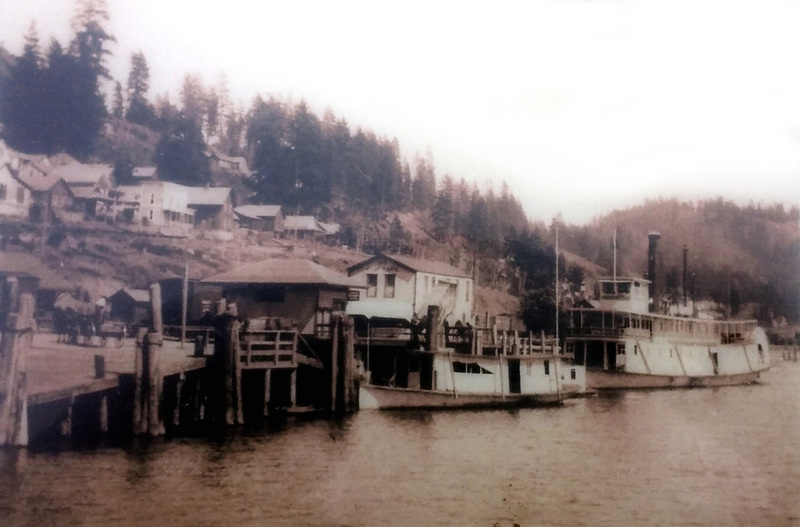 Steamboats hauled people and freight on Lake Coeur d'Alene, the Coeur d'Alene River, and the St. Joe River before roads and railroads were built in the area. Models of the steamboats The Flyer, The Georgie Oakes, and The Harrison are on display at the Crane House Historical Museum. The Amelia Wheaton was the first of the steamboats on the lake, built in 1888 to control anticipated Indian trouble that never materialized, and to supply Fort Sherman on the lake's north end, with food and stock produced in the area. After the gold rush started, the army agreed to let prospectors headed to the gold fields ride on the Amelia Wheaton. Indians and settlers around the lake cut wood for the steamers, for which they were paid $2.50 per cord. The steamboats and the Silver Valley mines both required large amounts of wood, a situation that helped settlers and entrepreneurs prosper here. One time, all available cutters were pressed into service to supply an order for 1,000 cords of wood to be loaded on barges and delivered to the mining country. The steamboat stop at Harrison was a busy place. The steamboat Boneta was a champion freight hauler; the Coeur d’Alene, Kootenai, and General Sherman specialized in transporting ore from the mining district. Steamboats hauled Indians on horseback, miners with their grubstakes, and loggers, and homesteaders as they went about their business. The boats were a lifeline to the early settlers because they hauled people, their supplies, stock, and freight. The Corwine stopped at Harrison to and from St. Joe country, laden with freight and passengers. The Georgia Oakes and the Flyer would stop to pick up passengers at O’Gara if they waved a flag. Around 1900, excursion boats carrying as many as 1,000 people featured moonlight cruises, dining, and dancing. Amenities on the steamers were plush by standards of the day. They had comfortable stuffed couches, carpets and rugs, and electric lights. People from the booming frontier cities of Spokane and Coeur d'Alene dressed up and boarded the boats for pleasure excursions on the lake and up the Couer d'Alene and St. Joe Rivers. Dance barges were sometimes pulled behind steamboats on moonlight excursions. Dancers swayed on the dance floor while bands played and the water glittered under the full moon. The stern wheeler Idaho made a brief stop in Harrison on her first trip from Coeur d'Alene to St. Maries on Aug. 23, 1903, with 300 passengers and freight. The Idaho, was the first of many boats built for the Coeur d'Alene and St. Joe Transportation Company, later known as the Red Collar Line. It was 147 feet long -- the largest steamboat to ever ply the local waters -- and could accommodate 1,000 passengers plus freight. Each side wheel was 21 feet in diameter. She had a dining room, wet bar, and 800 horsepower dynamo that powered 125 lights. Towards the end of 1903, the Spokane and Inland Empire Electric Line railroad train went into service, and the Idaho would meet the trains at Harrison to carry passengers up the lake and river. 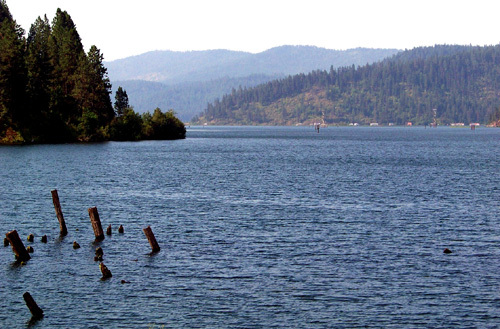 At one time the steamboat trade on Lake Coeur d'Alene was the greatest of any lake west of the Great Lakes. The 600-passenger stern wheeler, Harrison, was built at Lacon by the Oregon Washington Railway & Navigation Company in 1912. 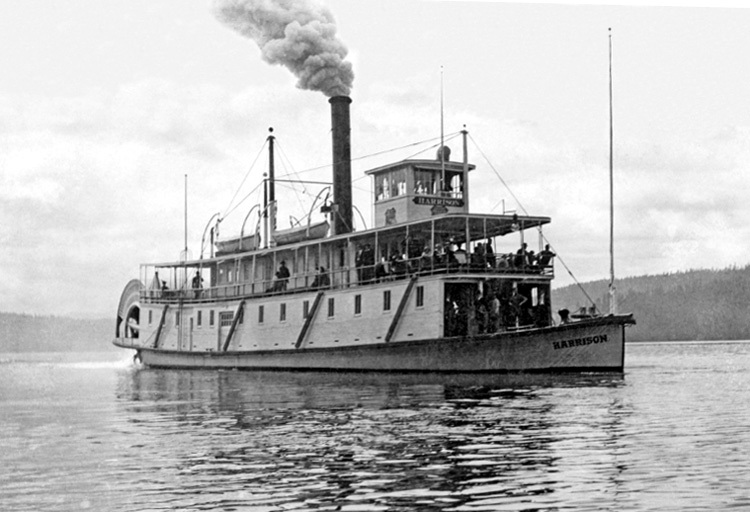 The paddle-wheel steamer shuttled passengers between Harrison and the Amwaco landing across the lake, where people could board a train to Spokane. Many Harrisonites celebrated a day by boarding the Harrison and riding over to Amwaco and back for the excitement of coming swinging into the Harrison dock with a big flourish and a long whistle. Passenger service stopped in the early 1920’s. Freight service carried on until 1932 when the line was discontinued. The Harrison served passengers at Harrison for eight years. The Georgie Oakes was the lady of the lake from 1881 to 1920. She was 150 feet long and 24 feet wide at her beam with a capacity of 1,000 passengers. For years the Georgie Oakes made stops at Harrison on her run to the old Mission. Then in 1896 she was changed to a direct Coeur d’Alene to Harrison route. One of Georgie Oakes' more colorful chefs, Tex Arner, had a whim for creating intriguing menus. Here are samples of meals available on the boat. Old pilings, like these at Shingle Bay, are the vestiges of historical activities on Lake Coeur d'Alene. A ferry ran across the lake from O'Gara Bay, and farmers from Harrison Flats would cross there to take their grain to Worley for processing and storage. The boats mentioned here are only a few examples of the many that plied local waters. Here is a more comprehensive article about steamboats on Lake Coeur d'Alene, written by Don Heikkila. Here are more pictures of Steamboats on Lake Coeur d'Alene. If you have a correction or fact to share about steamboats around Harrison, please provide it on this form. Please put "Steamboats" as the heading to your comment.